Teleport/Island Records artist Bishop Briggs, the UK singer and songwriter whose track “River” amassed over 24 million global streams and soared to #3 on the Alternative chart, will perform a new track, “The Way I Do” live on February 6th for her first appearance on TBS’ Conan. The Conan performance follows today’s announcement of Bishop Briggs’ first major headlining North American tour, opening April 18th at The Showbox in Seattle. 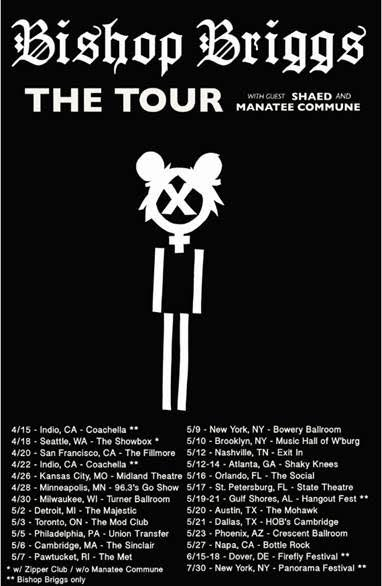 Over the first 10 days of the tour, Bishop will play the Coachella Festival on Saturday, April 15th, and Saturday, April 22nd. Tickets will be available for purchase starting Friday, February 3rd at 10am local time at http://bishopbriggs.com/tour. Conan marks the third major U.S. late night appearance for Bishop Briggs. She made her late night debut performing “River” on NBC’s The Tonight Show Starring Jimmy Fallon; watch that performance HERE. She performed “Wild Horses” on NBC’s Late Night With Seth Meyers; watch that performance HERE. Watch and share the official “Wild Horses” video at VEVO and YouTube. Born in London to Scottish parents, raised in Japan and Hong Kong, and writing her own songs since age seven, Bishop Briggs was already immersed in American pop-culture by the time she moved to Los Angeles to attend college. She persevered in L.A., focused on a clear mission, and was never too proud to play any venue that would have her, often to crowds smaller than would gather in her childhood living room. She honed her artistic vision with the help of producers Mark Jackson and Ian Brendon Scott. 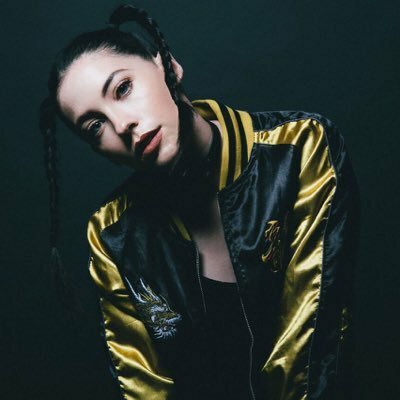 Bishop Briggs’ music now transcends the limitations of singular genres, blending folk, pop and electronic music into a wholly unique sound. Her voice, lived-in and unafraid, has been likened to artists as varied as Janis Joplin, Florence Welch, Aretha Franklin, and Brittany Howard (Alabama Shakes), but Bishop foregoes restraint and defies categorization, forging a path that is uniquely hers. With more new material, recent live performances/opening slots for Coldplay, Passion Pit and Kaleo, and a headlining tour, Bishop Briggs is poised to be one of 2017’s biggest breakout artists. Whether it is the rapture of “River” or defiance of “Wild Horses,” Bishop Briggs’ songs are all inspired by what she calls “the biggest, most toxic and tragic love affair I’ve ever had”: her lifelong commitment to music.